Home > Faqs > Are High Interest Store Cards Easy to Obtain? Store cards work in much the same way as credit cards with interest rates and monthly repayments. Many store cards also come with very high rates of interest, and in some cases the higher the interest the easier it is to obtain them. Why Would Shoppers Require a Store Card? Store cards are generally used within a certain department store or a national chain of stores. They work in much the same method as a credit card. Customers can purchase goods on a store card up to their designated store card limit. There may be interest free periods available and interest will not apply if customers pay off the account balance within a certain time period. For emergency purchases or spreading the cost of shopping, store cards can have their advantages. What are the Disadvantages of Store Cards? 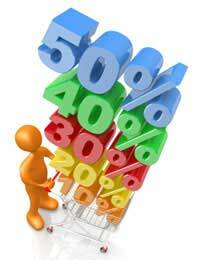 Store cards usually come with very high interest rates when compared with credit cards. The high annual percentage rate (APR) is one of the main disadvantages, and store cards will not usually be an ideal credit option. Customers who can clear their balance every month can enjoy interest free shopping. But many people have found themselves in serious debt problems simply by abusing the store cards. It only takes one or two missed payments to see the interest and missed payment charges accumulate on store cards. What Incentives Are Used by Store Card Providers? Store card providers will often offer discounts to shoppers who open a store card account in-store. This can be as much as 10% off the first purchase. This can be a good deal if shoppers can clear their balances within the interest free period. More often than not, shoppers never manage to clear their balances and will end up paying interest. This amounts to a significant increase on the original amount that the goods could have been purchased for using cash. How Easy Are Store Cards to Obtain? Store cards can be fairly simply to obtain when compared to credit cards that come with relatively low annual percentage rates. One recent investigation by the consumer group Which involved sending a graduate earning £1000 per month to apply for multiple store cards. Half of the 12 stores the graduate applied to for credit supplied their store cards. This means the test subject could spend £2500 freely on six store cards straight away. The instant application process means that credit checks are not undertaken or are being ignored. Are Store Card Providers Lending Responsibly? Responsible lending should be an important issue when providing credit but for many stores this is not considered. The higher interest applied to store cards can often mean that credit checks are not as stringent as they would be through credit card applications. There are certain high street stores that actually advertise ‘no credit checks’ as an enticement. It is often the low income earners who do take out the high interest store cards as they have very little other credit options. Responsible lending is a serious issue and companies found to be practicing irresponsible lending can face severe consequences. There is a big difference between applying for a credit card and a store card. Credit card applications can take make many weeks to be processed and will involve credit checks. Store card applications can take place there and then on the spot in stores. Untrained employees will often forget to ask the customer for permission to proceed with a credit check. Customers can often be given credit as soon as they apply in store. Many stores do take the necessary precautions but as the Which group investigation proved many stores are not as a stringent. What Are the Debt Consequences for Shoppers? High interest, whether on credit cards or store cards, can easily bring unmanageable debts. Young people especially are very easily enticed towards opening store cards with their favourite stores. These high interest store card debts can mount up very quickly and after a few missed payments are often sold on to debt collectors. This will mean that debtors will have bad credit references and in some cases County Court Judgements. Paying by cash or debit card means shoppers can avoid high interest rates and simply pay the amount the goods are sold for in the stores.